I first met Bobbi Tanberg at a luncheon in January 2007 where she was honored by the Los Angeles County Board of Supervisors with the 2006 Access Award for public service and making a difference in the disability community. If you ask Bobbi Jean, she would tell you that she loves what she does and her real reward comes from helping people with disabilities. At that time I was still publishing Disabled Dealer and I knew right then she was going to be the subject of my next feature! When Bobbi first came to Rancho Los Amigos National Rehabilitation Center, one of the premier rehab facilities in the nation, her recreation therapist and future colleague, Greg Thompson, introduced her to wheelchair sports. As fellow athletes, they both saw the numerous physical and psychological advantages to the adaptive activity. Furthermore, they found they shared a belief that persons with disabilities should not abandon their life goals, education, employment, having a family, etc. 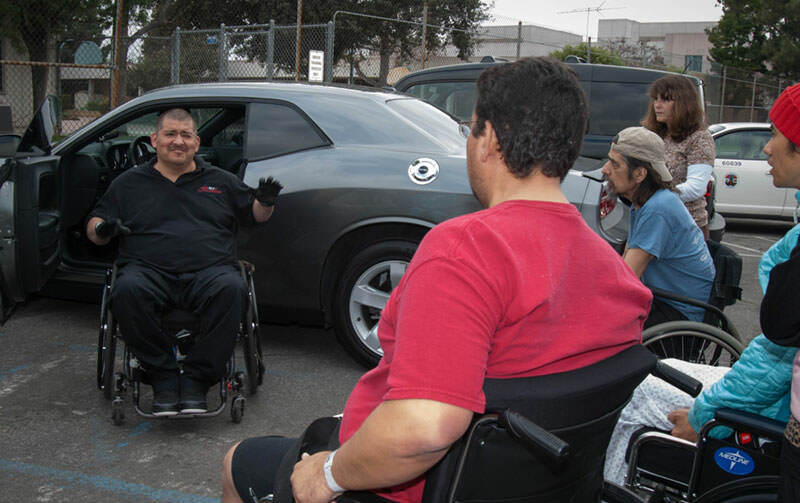 They wanted to empower the disability community to learn from the success of others and decided to further leverage Rancho's resources to achieve those lofty goals. 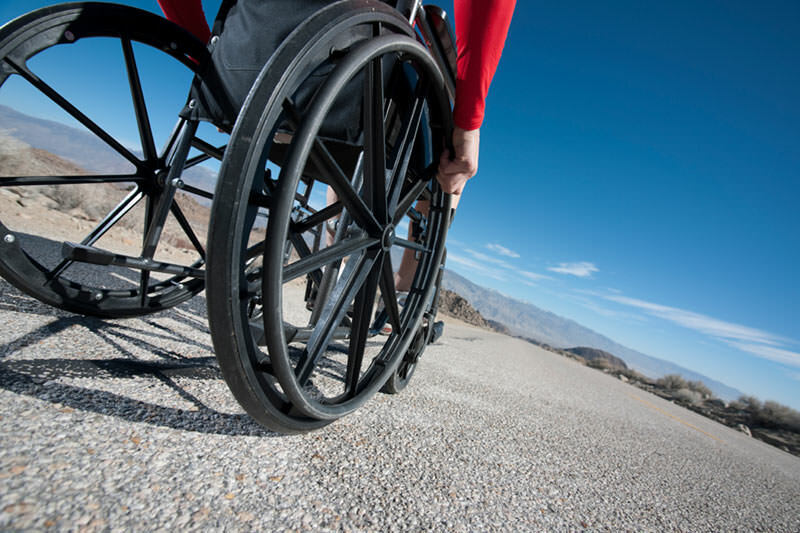 In 2003, Greg and Bobbi began writing for a grant to provide life coaching services to people with a spinal cord injury and KnowBarriers was born. achieve their life goals through individualized life coaching and peer mentor services. Bobbi finds her work as a life coach extremely rewarding and feels honored to give back the emotional support that she received when she was first injured. It was a delight meeting with Bobbi again, this time at Rancho. The first order of business when I arrived was a tour graciously provided by Director of Peer Mentoring Services Robert Rohan, who detailed the many facets of the KnowBarriers program. He explained that the peer mentors who engage with newly injured patients must be a minimum of one year past the onset of their disability/diagnosis and complete rigorous, high quality training program. Following completion of the six-month probationary period, staff is eligible for a paid contract position, based on program needs and available funds. Peer mentors co-lead patient education classes, provide skill demonstration for patients and staff, call patients after they leave the hospital, participate in community outings, supervise participants in the Rancho Wellness Center and the Life Gym, and provide overall support to patients and families during the adjustment to their injury. I was really impressed with the entire process. And Rancho patients pay nothing! Know Barriers services are funded through a philanthropic foundation, discretionary funds from Supervisor Don Knabe and a contract with the County of Los Angeles. Chris: How long have you worked for Rancho? Bobbi: KnowBarriers is a program offering individualized peer mentor and life coaching services to the patients of Rancho Los Amigos National Rehabilitation Center. Our programs are unique in several ways. Following a formal general peer mentor training of approximately 30 hours, peer mentors are assigned to specific positions/roles in the hospital which vary based on the needs of that patient population or service. The peer mentors at Rancho are integrated into inpatient and outpatient therapy, medical services and our Wellness Center Resource Room and Life Gym. Our peer mentors are seen as a critical compliment to the clinical expertise of our interdisciplinary team of professionals (therapists, nurses, doctors, social worker, psychologist, etc.). The KnowBarriers life coaching program primarily works with patients who have completed their outpatient rehabilitation program and are ready to set and achieve goals to improve the quality of their life. Each client goals are as unique as the individual, though common goals include returning to school or work, independence in the community, driving, establishing a healthy relationship, etc. The life coaching is a formal program provided by specially trained life coaches; all of whom also have a physical disability and the majority of whom have additional clinical experience and training. Clients participate for one year, receiving support, accountability, resources and problem solving through in person or over the phone coaching sessions approximately three times per month for three to six months. Standardized assessments are used to monitor their progress during and six months after the life coaching services stop. KnowBarriers is unique to have established funds to pay both our peer mentors and life coaches to provide these services at Rancho with no cost to the patient. Over the years we have had funding from grants and philanthropic organizations. Our greatest supporter from the program's inception has been LA County Supervisor Don Knabe. Most recently, we were able to demonstrate the value to patient care and Rancho established individual contracts for service from the County of Los Angeles. Many of our staff continue to provide services in a volunteer capacity—this is their preference. Chris: Where did the program start? Bobbi: The program began in 2005 by Greg Thompson, LCSW and myself, with grant funding from the Christopher and Dana Reeves Foundation. Chris: Can anyone join the program? Do you charge? Bobbi: We provide services free of charge to patients of Rancho Los Amigos National Rehabilitation Center. Non-Rancho patients can request services and we will work with that agency to provide services on a sliding fee scale. Chris: How do you find your mentors? Bobbi: Peer Mentoring at Rancho is conducted through a former patient/person with a disability, specially trained to share their valuable life experience in a way that promotes the learning and skill development of our patients. Peer mentoring compliments the education and rehabilitation services of licensed professional staff, while providing hope and modeling the high quality of life that we want our patients to strive to achieve. The impact the peer mentors and life coaches have on our patients, their families and staff, on a daily basis, is truly immeasurable. I could not be prouder to be a part of this program. For more information on KnowBarriers, visit www.KnowBarriers.org or contact Amy McKnight at (562) 401-6298 for life coaching services and Robert Rohan at (562) 401-8175 for peer mentoring services. Chris Rohan became involved with disabilities more than 25 years when her son was seriously injured in a bicycle accident in 1989 which rendered him a quadriplegic. In August 2001 along with her husband Jim, she published Disabled Dealer Magazine for the disability community. In August of 2013, the magazine closed. Chris didn't stop there—her latest venture is an Ambassador for the Abilities Expo. For more on Chris, visit www.facebook.com/crohan3.